If the great Charles Dickens were looking to write a sequel to “A Tale of Two Cities,” Luke Fickell and the Ohio State Buckeyes might want to add “A Tales of Two Halves” to the realm of possibilities. The Buckeyes reversed their offensive fortunes of a week ago against Michigan State, and the scarlet and gray marched down the field four times in the first half to put 20 points up on the scoreboard. Unfortunately after scoring a touchdown on their first possession of the second half, the Ohio State defense gave up 28 unanswered points en route to a 34-27 loss at the hands of the Nebraska Cornhuskers. With another tough road test on the horizon, it’s time once again for a little Scarlet and Gray Q&A. What was a bigger turning point, Braxton Miller’s injury or Miller’s fumble? I had a caller on the weekday radio show I co-host call Miller’s fumble a Bill Buckner like moment on the football field. It was interesting to hear those two events being compared to one another. While it might seem apt to say that Miller’s fumble had an impact on the game, because it did, I don’t see it in the same light as I do the injury sustained by Braxton in the third quarter. Was it just me or did anyone else feel like the body language on the field was entirely different with Joe Bauserman directing the offense? It was so clear that there just seemed to be a total lack of confidence by the entire team once number 5 was relegated to the bench with the sprained ankle. Heck, I think even Joe Bauserman was uncomfortable with himself being the quarterback on the team. Miller’s injury had more than just an effect on the confidence of the team too. It was a rippling effect on down the line. Tons of three and outs meant the defense needed to be on the field a lot more in the second half. Not only that but they were going against one of the fastest offenses in all of college football. If there was ever a need for a demonstration of Murphy’s Law, Ohio State’s offense against Michigan State might be an apt tool to use. Everything that could go wrong for the Buckeyes did last Saturday when the scarlet and gray had possession of the football. Nothing went right, and any glimmer of hope that occurred, like the 33 yard pass completion to Chris Fields, was instantly snuffed out before the offense could make anything of it. With all the on the field issues, the last thing the Buckeye faithful needed were more NCAA issues that crept up at the beginning of this week. With so much unknown, it is time to dive into a little Scarlet and Gray Q&A. How long have you got? I could write a book this week about what is plaguing the Ohio State offense, but instead I have compiled a list of concerns and ways to fix them. It would be easy to say Ohio State is better than what we saw on Saturday night in Miami. Dismissal of the 24-6 loss as an aberration would make us all sleep better at night. The truth is there have been few with the courage to say this outright: the Buckeyes are going to struggle. I am still struck by a conversation I had with another media member before the season about how Ohio State was going to fare on the football field. He told me he saw four losses on the schedule, and if he looked hard enough he could see six. Crazy as it sounded then and still a little even now, the reality of where Ohio State football is and where people want it to be is vastly different. The game’s lopsided result has spawned plenty of questions, and until the Buckeyes take to the field against Colorado, there will be few, if any, clear answers. From the greatest football minds to the most arrogant arm chair coaches, the quick fix for what ails this football team seems to be elusive at this point. A team with so many questions and so few answers would be bound to struggle. Here is a short list I have compiled, and my best attempt at answering them. 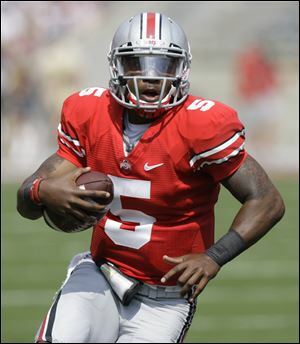 I devoted almost 1,000 words last week as to why Braxton Miller should be the starting quarterback, and even after seeing his lowlights from the game, Miller should still be the full time starter. There is an old saying that history often repeats itself. 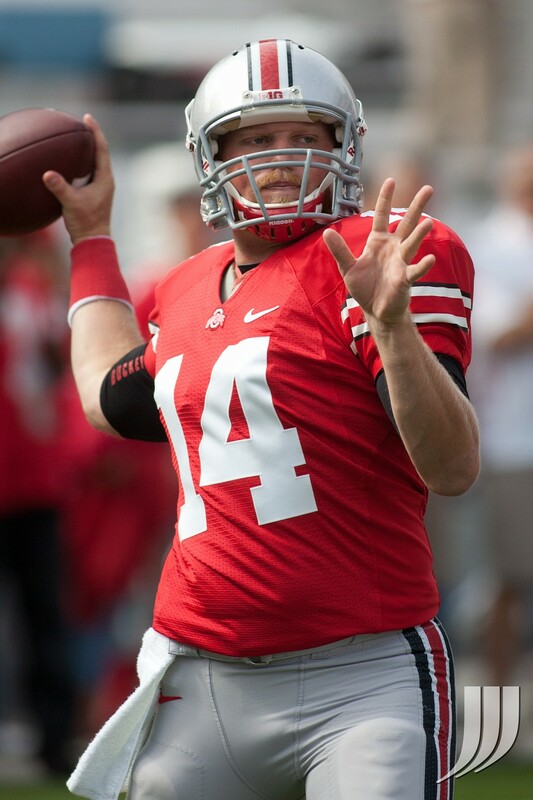 When it comes to a quarterback derby, Ohio State’s history is fraught with them. It became clear with each boo on Saturday from the 105,000 fans crammed into Ohio Stadium that the honeymoon with Joe Bauserman is over. With every errant pass, throngs of scarlet and gray clad spectators wondered when it was going to be Miller Time, well Braxton Miller time. Whether a change needs to be made or not, the problem is nothing new when it comes to Buckeye signal callers. Stan Jackson and Joe Germaine duked it out in the late 90’s. Steve Bellisari and Austin Moherman dueled at the turn of the century, and most recently Terelle and Todd fought for the job in 2008. While the Bauserman – Braxton affair has many similarities to the Boeckman and Pryor battle, this one resembles one that unfolded right in front of my eyes: Troy Smith vs. Justin Zwick.